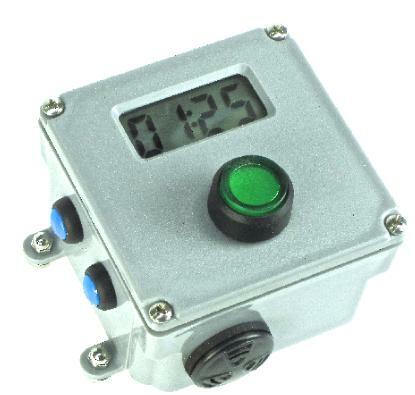 WATERPROOF PUSH-BUTTON TIMERS for INDUSTRIAL use that count down from the time you set, then they beep and flash, or provide relay output. Waterproof, corrosion proof and built for rough industrial use. Battery powered or AC power. Ideal for many uses from chemical plants to hot tubs. DIGITAL WATERPROOF PROCESS TIMER counts down from the time you set, then it beeps and flashes until cancelled. Time range from 1 second to 100 hours. As simple to operate as a kitchen timer. Waterproof meant for tough industrial environments. Loudest Buzzer 103dB warbling tone cuts through the loudest industrial noise. Simple and Intuitive. No need for instructions and can change times on the fly. Battery Powered. Lithium battery lasts for years. Large Digital Display. Digit height 18 mm. Digital Timer counts down from the time you set. When the cycle is completed, a very loud 103dB warbling buzzer sounds and the illuminated button lights up. Resets automatically to the same time for the next cycle. Easy to program with only three pushbuttons. Many possible operating modes are selectable with switches inside the box. You can control if a cycle is able to be cancelled or not, automatic cycle end or manual, timing in HH:MM or MM:SS, relay orientation, repeating cycles, guard duty. See details in the instructions below. Waterproof. Corrosion Proof. IP65 (NEMA 4X) enclosure is built for plating lines, commerical kitchens, factories, wet or corrosive environments, indoors or out. Operation Easy to set the time: the blue buttons adjust the time up or down. The large green button starts and stops the time cycle, or cancels a cycle if permitted by the mode. The Loudest Buzzer This is the loudest buzzer we know of on a digital timer. Don't be fooled by volume ratings from other manufactuers as they may give a high volume number but this is meaningless without knowing the distance! Extra: Once the countdown time reaches zero, the timer then counts the overrun so you know how long the timer has been alarming. Low Power Draw. Extremely lower power circuitry allows the 9V battery to last for years. Outputs. Auxilliary 9VDC output is built-in to power dataloggers, autodialers or other external devices. AC powered version with a relay to control your devices is available in the model T5 on this page. Magnets on the feet allow the unit to be mounted on metal surfaces like ovens. Higher visibility strobing light illuminates when a cycle is over. Available in red, blue, amber, and green. Different buzzer tones to audibly identify different units. Snap on muffler reduces the volume by 20 dB and anywhere in-between just by rotating the slots. When the timing must be traceable, we can provide a calibration certificate. 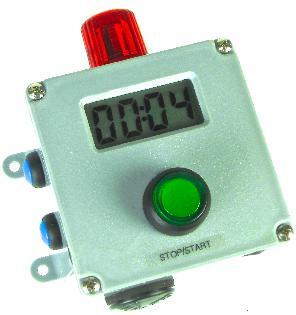 PUSH BUTTON TIMER that counts down from the time you set, then it beeps and flashes. Waterproof, corrosion proof and built for rough use. Relay output to control pumps. Ideal for plating, spas, wet areas. Time is Easily Adjustable from 1 second to 99 minutes using discrete position rotary switches. No guessing with potentiometers! Easy Installation. Simply screw it in place and connect your pump - no hard wiring. 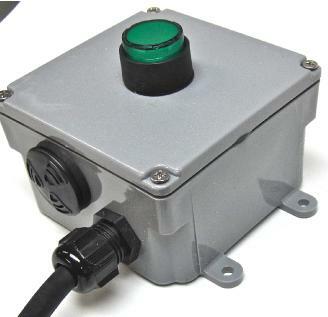 Water Proof and Corrosion Proof PVC enclosure and push button are NEMA 4X rated. Built for rugged industrial service. Compact 4x4x2" box extends out from tank only 85 mm. Loud Warbling 103 dB audible alarm. Relay Output 15A @ 120VAC to control 1/2HP pumps, motors. Convenient connection to your pump with the piggyback plug provided. Easy Installation, just mount it in place and plug in the piggyback plug. A single button starts and stops the timing cycle. The time is set easily with the intuitive pushbutton switches and digital indicator inside the box. No calibrating or guessing is necessary as with timers that use potentiometers. The time is accurate to the second. Once the time is set, you can close the cover and not worry about the time being tampered with. Wide Timing Range Counts down anywhere between 1 second to 99 hours, and anywhere in between. Relay Output. Relay output is 10A @120 VAC. (1/2 HP at 120V) Normally Open by default, (relay is open when not timing) or specify Normally Closed. Operation The time counts down from preset time. Exterior button illuminates while timing. 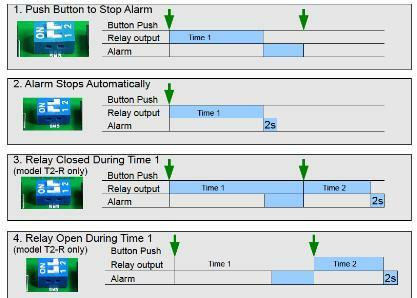 At the end of the time cycle, the alarm beeps 5 times and then relay resets automatically. 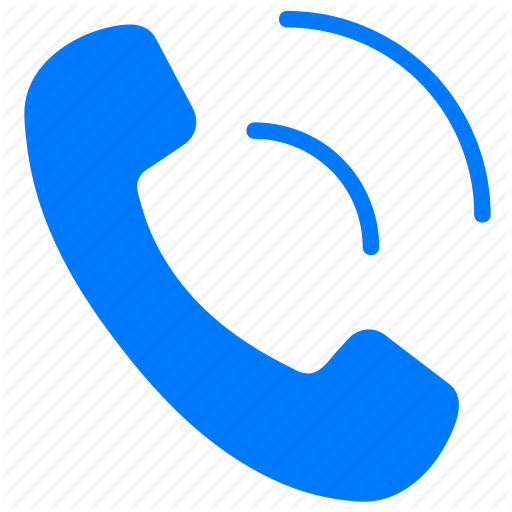 The cycle may be cancelled at any time by pushing the external illuminated button. Select from many different operating modes available by setting the on-board jumpers. With these modes you can control if the cycle may be cancelled in mid-cycle or not, if the cycle stops automatically or requres manual stoppage using the pushbutton, and repeating cycles etc. See instruction sheet for full details. Power The T3 timer is powered from the piggyback cord running from your pump. (120VAC) Non-volatile memory in case of power outages. WATERPROOF PROCESS TIMER counts down from the time you set, then it beeps and flashes until cancelled. Time range from 1 second to 99 hours. 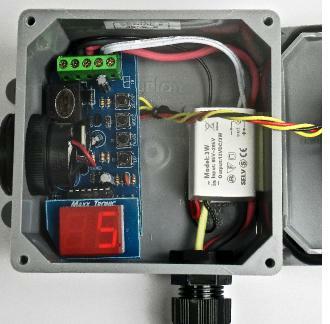 As simple to operate as a kitchen timer. Loud warbling 103dB warbling tone cuts through the loudest industrial noise. Simple - No need for instructions and can change times on the fly. 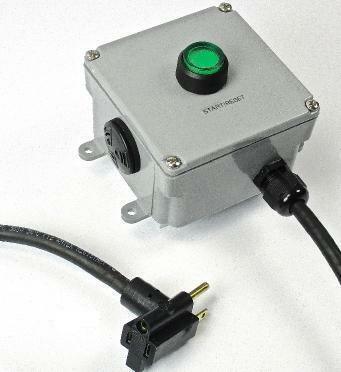 High Current Capacity The T5 has a 15A relay which will control up to 1/2 HP @ 120V. 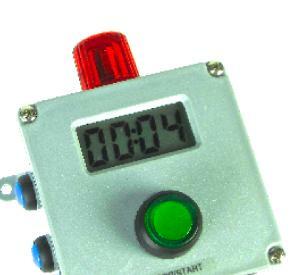 Digital Process Timer is easy to program with only three pushbuttons. Counts down the cycle you set and then resets to the same time for the next cycle. When the cycle is completed, a very loud 103dB warbling buzzer sounds and the illuminated button lights up and strobing LED activates. Relay and piggyback cord included to control devices. Many Possible operating modes are possible which are selectable with switches inside the box. You can control if a cycle is able to be cancelled or not, automatic cycle end or manual, timing in HH:MM or HH:MM, relay orientation, repeating cycles, and custom cycles can be programmed reasonably. Waterproof, Corrosion Proof IP65 (NEMA 4X) enclosure makes this suitable for wet, corrosive production floors or outdoors. Operation The blue buttons adjust the time up or down. 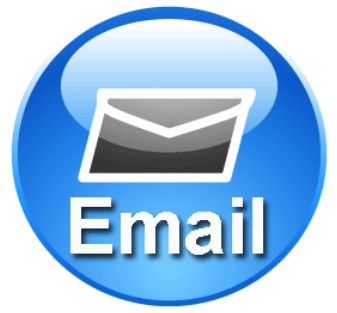 The large green button starts the time cycle/ cancels if applicable, or stops the time. More Features: Backlit display. Strobing LED included. 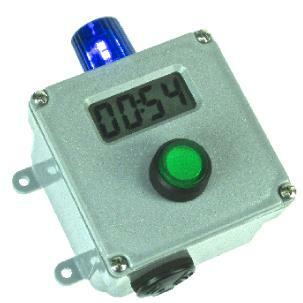 PUSH BUTTON RINSE TANK TIMER is suitable for repetitive process timing. It has a relay output to control devices like solenoid valves. Two independent timer cycles up to 99 minutes each. Waterproof and corrosion proof. Perfect for plating processes. Loud Warbling Alarm easily pierces through the loudest loud industrial plant noise. Waterproof All parts are NEMA 4X rated. Built for rugged industrial service. Relay Output 15A will control 3/4 HP motors, solenoids, heaters. Time is easily adjustable from 1-99 seconds or 1-99 minutes using discrete position rotary switches. 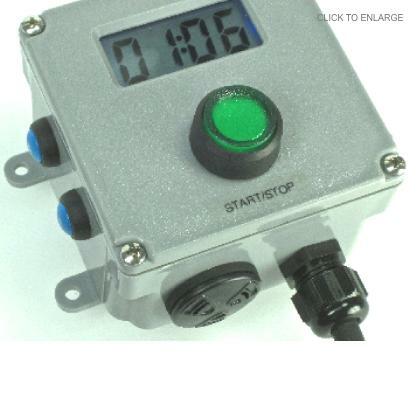 Rinse control with a timer is easier and more reliable than with a conductivity controller. The Rinse Tank Timer model T2 has a 15A relay output. Two time cycles are independently settable. Each can range from 1 second to 99 minutes. Typical Operation: At the end of the first time cycle, when a load should be removed from a rinse tank for example, the illuminated push button flashes and the audio buzzer sounds. When the button is pushed to silence the alarm, the second time cycle from 1sec-99min starts. The second time cycle can open a solenoid valve to control rinse water flow. When the second time cycle is complete, the buzzer sounds briefly. Alternate Operation Mode: The first time cycle could be used to prepare the tank by turning on a heater to warm it up, or to dose chemicals by turning on a pump. When the first time cycle has elapsed and the rinse is prepared, the buzzer sounds until acknowledged. This is a cue to run work through the tank. At the end of the second time cycle the buzzer sounds again. Construction: Timer model T2 is enclosed in a PVC box 4 x 4 x 2" with stainless steel screws. Rated NEMA 4X - suitable for washdown duty. The buzzer is 103dB and has a warbling tone that pierces through loud ambient noise. Stainless steel transducer can get wet. Relay Output:The 15A relay controls pumps and solenoids using a convenient piggyback plug. The piggyback plug on the end of a 10 foot cord makes installation simple. Your pump or solenoid can plug into the female end and no further wiring is necessary. The T2 timer switches your devices on and off according to the time cycle. Setup: The operation mode is chosen with dip switches. (see chart above) The time is set with intuitive rotary switches to the precise time. No guessing with potentiometers. Once the time is set, just close the cover and it can't be tampered with.